Like other jack species, the horse-eye is a member of the Carangidae family and a strong-ﬁghting ﬁsh suitable for light-tackle angling. Unlike some jacks, it is not highly esteemed as a food ﬁsh, although the quality of horse-eye jack meat can be improved by cutting off the tail and bleeding the ﬁsh directly after it is caught. This and other jacks have been implicated in cases of ciguatera poisoning. tail fins and usually dark edges on the dorsal and the upper tail ﬁn. There is often a small black spot at the upper end of the gill cover, and it usually has blackish scutes. The body is compressed, and the entire chest is scaly. There are 20 to 22 soft rays in the dorsal ﬁn and 14 to 18 gill rakers on the lower limb of the first arch. The horse-eye jack is similar in shape to the crevalle jack, although it has a less steep forehead and is either lacking the dark blotch at the base of the pectoral fins of the crevalle jack, or the blotch is more poorly defined. 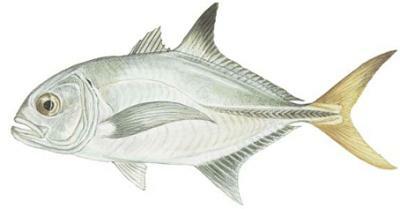 It can also be distinguished by its scales, which the crevalle jack lacks except for a small patch. This species is commonly found up to 30 inches and 10 pounds. The all-tackle world record is 24 pounds, 8 ounces. Horse-eye jacks feed on ﬁsh, shrimp, crabs, and other invertebrates. big-eye jack, goggle-eye, horse-eye trevally; French: carange moyole; Portuguese: guarajuba; Spanish: jurel, jurel ojo gordo, ojón, xurel. In the western Atlantic, horse-eye jacks occur from New Jersey and Bermuda throughout the northern Gulf of Mexico to Río de Janeiro in Brazil. 0 Response to "Horse-eye Jack (Caranx latus)"